It seems that too often, in conversations with those younger cooks who have some level of serious interest in a kitchen career, that food talk is all about experimentation. I have lost track of the number of culinary students who (and I paraphrase here) state: “When are we going to move on from the basics of cooking and start working with spherification and other forms of molecular gastronomy.” Many of these students view time spent with cooking foundations, the study of tradition and ethnic influences on cuisine, and the importance of knowing what ingredients are indigenously important to building time-tested dishes, as repetitive and uninspiring. Well, I will admit it right now – I am a proud traditionalist and make no apologies for it. This is not to say that I am, or thousands of other traditionalist chefs are adverse to creativity – in fact, just the opposite is true. Thomas Keller is a traditionalist (and proud of it), David Chang from Momufuko is a traditionalist and so is Eric Ripert of LeBernadin, Alice Waters of Chez Panisse, Marcus Samuelsson from Red Rooster, Charlie Palmer of Aureole, Daniel Boulud of Daniel, Charles Phan from the Slanted Door, and Gary Danko from Restaurant Gary Danko, as well as thousand of other very successful chefs across the globe. What do they know? They know what guests respond to and they know that the food they prepare is flavored with history, methodical dedication to solid technique, and refined by master technicians for generations. Each of these dishes, and all of the creative variations of them tells a story, a story that people want to hear. None of these chefs make apologies for being traditionalists. I would dare say (without any type of scientific polling) that every certified master chef in the U.S. is a traditionalist at heart and in practice. Foundational cooking and traditional preparations take years to perfect. Talent for these chefs comes in the form of patience and repetition. Read about the ingredients, build your skills, prepare it over and over, build your flavor palate, reflect back on the history of the dish and the culture behind it, compare it to others who have dedicated their lives to preparing it correctly, and know that you may never stop fine tuning that dish until it is right. A perfect Bolognese is a thing of beauty, but most Italian chefs will tell you that their sauce is not right until their grandmother says so. It may seem passé to some new cooks, but a perfectly prepared Veal Picatta will always be a crowd pleaser. Why is it that French onion soup still appears on so many menus? Because if prepared correctly it is truly delicious, and delicious is gratifying, and delicious sells! Don’t ever apologize for being a traditionalist – just make sure you dedicate yourself to doing it correctly. 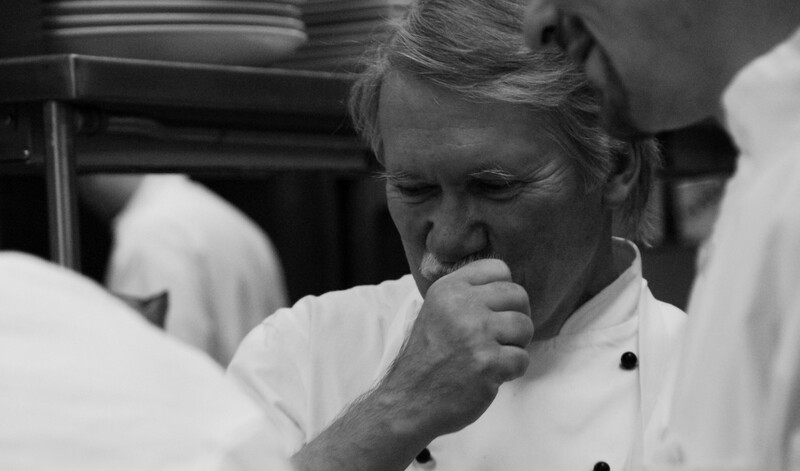 Great cooks and accomplished chefs invest the time to understand the food that they prepare. They study a cuisine and what makes it “traditional”. They don’t prepare French, Italian, Korean, African, or Yucatan cuisine – they become one with the food. They know the ingredients and how they are grown; they become familiar with the farmer and the producer; they study the way that vegetables are cut and why this is important; they know the steps that are associated with a cuisine and how the flavors are built; they understand timing, what wines balance the flavors, how seasonality can change a dish, why salt is added during or at the end of cooking and how certain spices change dramatically when heat is applied; they know why it is important to use a certain pot or pan and how failure to do so will likely change the dish; and they take pride in staying true to all of this information and process. Yes, they are traditionalists and they know that it takes time and dedication to get there. There is great satisfaction in earning the right to make a dish and place it’s name on a chef’s menu. This privilege doesn’t come from following a recipe, but rather from truly knowing the dish and everything about it and then enjoying the process. There is and will always be value in cutting edge process and anything “new” in a restaurant that defies the established standard. There is always room for the enjoyment of food as entertainment and I fully understand why many cooks find this fascinating and exciting, but as Chef Andre Soltner once said: “We must remember that we are all cooks” and it is important to understand that behind even the most avant garde chef’s desire to push the envelope and express him or herself in ways that make people wonder and applaud creativity, there lies a cook who understands the foundations and has the capacity to always rely on traditionalism. Take pride in the foundations and in classic dishes and know that they are timeless for a reason. Never lose sight of what it takes to make these dishes correctly and never apologize for your traditionalist roots. Couldn’t agree more! Alton Brown said it best during a presentation at an ACF convention- “no one wakes up in the middle of the night craving a foam”.